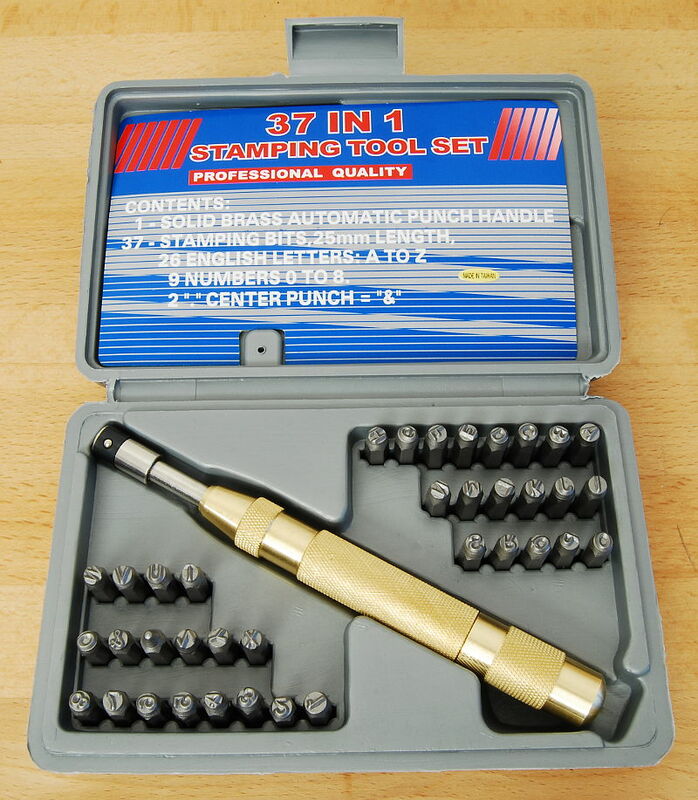 This simple stamping set comes in handy where ever you need to mark wood without needing to worry too much about the aesthetics. You can stamp initials or a personal mark on wooden parts of your tools, or use the stamps to permanently and neatly mark the individual pieces of a woodworking project to aid assembly, or on a piece that is designed to be dissembled for transport. The letters and numbers are about 6 mm high. 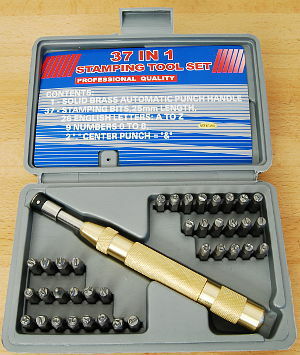 The stamping shaft has a 6.3 mm hexagonal socket. You insert the appropriate stamp in the socket, press it to the wood, and push down on the end of the shaft against an interior spring. When the spring release point is reached, it releases an interior hammer that strikes the stamp and marks the wood. The strength of the hammer blow can be adjusted by turning a knurled section of the shaft. You hold tool in both hands, and the end of the shaft is marked with a point to show the top of the letter or number, allowing you make sure the letters come out straight and even, as in the "169" in the top stamp photo, and not the crooked "N" and "I" in the bottom photo. 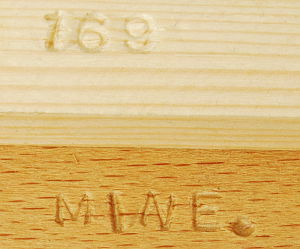 In the photos you see the stamps in pine (top) and red beech (bottom). Make sure you have the proper stamp in the shaft and that it is properly aligned -- you have to get it right the first time! 9 numbers: number 6 and 9 is one stamp!